The property and facilities at the hotel are fantastic. The hotel grounds and lobby are well maintained and the staff is friendly, efficient and accommodating. The room was fantastic. 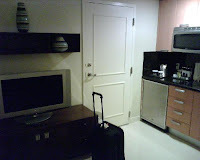 The studio suite had a separate bedroom, living room with a small kitchenette. The bathroom had a whirlpool tub and separate stand up shower with rainshower shower head. 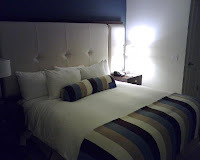 The room was immaculate and the housekeeping service cleaned the room perfect everyday. They return at night to replace towels and turn down the bed. The room has a balcony which looked out at the ocean. The balcony had two chairs with a table and two lounge chairs on it and was quite big. The gym at the hotel was fantastic with modern equipment and lots of it. There was a gym attendant who brought me a towel while I was working out and water. The hotel concierge was very nice and offered me a bottled water when I left the hotel. The hotel, facilities and rooms are great but the staff made it a fantastic stay and what sets apart hotels. 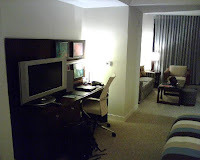 I will definitely return to this hotel next time I am in town and its recommended to all.